Texas House Representatives Are On The Take……..
First let me say thank you to my friend Kevin Jackson with The Black Sphere for that line “They are on the Take”. I just got off the phone with him and if you don’t know who he is you are missing out. He’s a great guy and doing wonderful work at the boots on the ground level. Let me just say it is lucky for Speaker Joe Struas that Kevin Jackson is not living in Texas. He would really be in big trouble. I am hoping at some point I can get Kevin to Texas so he can work a little Comedic magic and really bring out the issue of our State Reps. having their hands deep in Straus’ pockets. OK here is the deal, it is actually pretty simple. First watch this video and then just think about it. Basically what we have in Texas is a bunch of elected officials who are on ” The Take” and are putting their name on the list as willing to be funded for their reelection campaign by the Speaker of the Texas House. Question, is there something wrong with this picture? Here is how the Pledge Card System works. For some background: the Texas Speaker of the House is a powerful position, elected from among the 150 State Representatives as the first act of any incoming legislature. However, there has been a long-standing ‘tradition’ of pledge cards that has made this nothing but a sham in the case of a seated speaker. The real backroom process is about as democratic as a mugging and is a tradition than needs to go the way of the Chicken Ranch. Here’s how it really works. A seated Speaker has hordes of special interests slavering to do favors for the one individual that controls ALL legislation- and tens of billions in State spending. And they have VERY deep pockets for donating vasts sums for campaigns. toward the end of the session, the Speaker will approach each representative and ask for them to sign a pledge card, promising to support the Speaker for re-election in the NEXT session. And everyone KNOWS that donations and future committee assignments are tied to this decision. This last session, redistricting was also a weapon to be used and it apparently was, resulting in a kangaroo court version of an ethics investigation. Normally, a seated Speaker can get nearly all of his own party’s cards; they ALSO can get many for the opposing party, based on favorable committee assignments and- you can be assured- assistance at killing selective majority party legislation by letting it die in the committees controlled by the Speaker. And in open seats, candidates parade down to Austin looking for donations for their runs. They are judged by the ‘powers that be’, on whether they are willing to ‘play the game’. In the majority party, that very often involves a willingness to sign a pre-election pledge card. Sign a pledge, and doors are opened and donations made. The major problem with the raw exercise of political power is there is ZERO input by the electorate in this. They don’t wait for the office holder or candidates are validated by the voters; they don’t brook any input from the electorate after. This is the power of the ‘Austin machine’ and it is time to challenge that when it matters- BEFORE the session is out, BEFORE the election. “Don’t Retreat, Reload” – No Pledge Card!! Oust Straus Once and For All……. Our Voices were heard and they were once again ignored. With Redistricting we have just witnessed a classic case of Texas style Good Ol’ Boy Republican establishment. While Perry’s decision to not sign the SBOE Redistricting bill is a good thing he chose not to stand with Conservatives and Veto the bill. I have been told the reason is, had he vetoed the bill it would have gone back for a vote in the legislature and they had the votes to override his Veto. So much for a Conservative Republican majority. I was also told if he had vetoed the bill it would have gone to the Obama Justice Department and we all know Obama has it out for Texas and especially Gov. Perry since he seems to be a possible opponent in the 2012 election. The challenge is, so much of this was done behind the scenes and we do not know who the good guys are and who the bad guys are. Targets #1 and #2 for the primaries, Texas Rep. Burt Solomons and Sen. Kel Seliger. The reason why the Texas School Board of Education Redistricting is so important to Moderate Republicans and why they are fighting to flush out Conservative Republicans is…….As they say follow the money. Social Studies and text books are just a side show to Rino Republicans in Austin. It is about the money!!! Although they play on everyone’s emotions and say that it is all about the children. I can tell you one thing for sure, for those Conservative SBOE Representatives who have been redistricted out it is about the children and Texas children have just been shafted by Republican in Name Only elected officials. AKA RINO’s that we put into office. My question is what are the parents of those children going to do about it. Personally my plan is to Not Retreat but to Reload, just as Sarah Palin stated. First Call to Action – Don’t allow the Pledge Card system to continue. 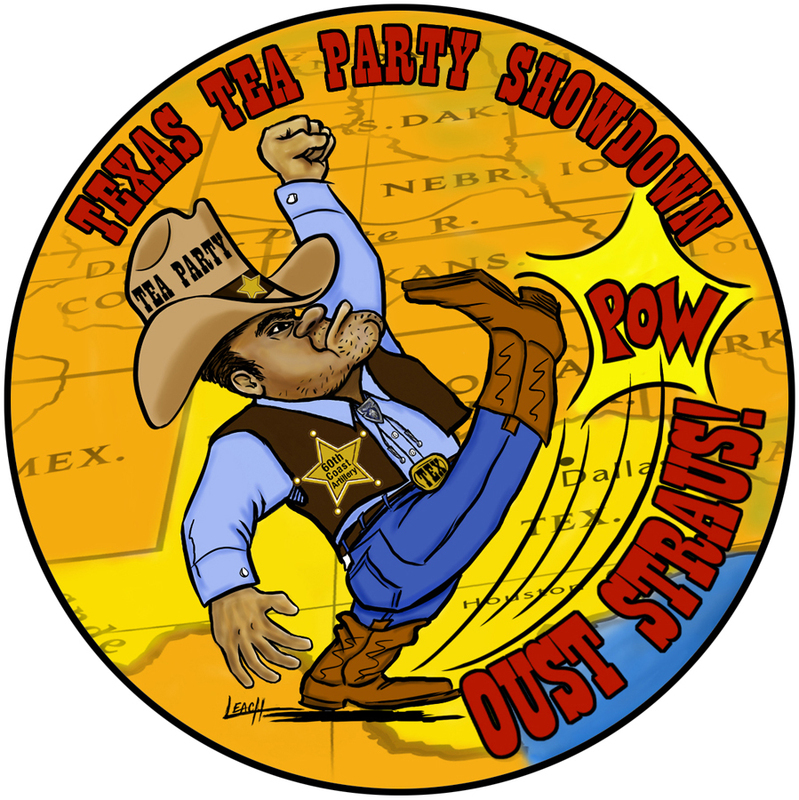 Tea Party folks – Are you with me? OUST STRAUS once and for all! !